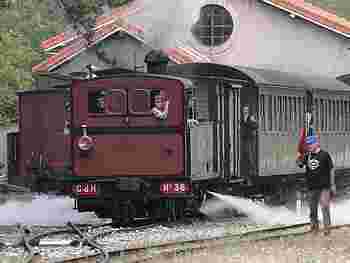 On this blog I intend to publish information on heritage (historic, tourist, ...) railways in Provence, the lines with historic rolling stock, viz. 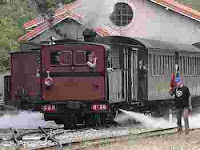 the Train de Pignes steam train located in Puget-Thénier (operating on the Villar-sur-Var - Annot part of the Nice - Digne one meter gauge line), the Train du Centre Var historic train (with service Carnoules - Brignoles - Saint Maximin-la-Sainte-Baume on the Gardanne - Carnoules standard gauge line), and the Train des Alpilles located in Arles (with trains between Arles and Fontvielle). The three tourist trains offer a variety of experiences in terms of age of equipment (late 19th century to late 20th), type of pulling engine (steam, diesel, railcar) and the type of countryside and vegetation (mountains, hills, vineyards, plains, rice fields, ...). These are the heritage railways in Provence, i.e that part of the PACA (Provence Alpes Côte d'Azur) region limited (1) in the south by the Mediterranean sea, (2) in the west by the river Rhône, (3) in the east by the the river Var and, (4) in the north approximately by a line drawn from Pont-Saint-Esprit (at Rhône, north of Orange) to the sources of the river Var. Blog posts are expected to be of interest to in particular train enthusiasts and tourists to the French Riviera and other tourist destinations in the PACA region, as well as other tourists looking for an interesting train excursion during their stay in south-east France.